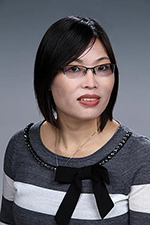 Congratulations to Dr. Jiwen Fan, atmospheric scientist at Pacific Northwest National Laboratory. She is the lead author of the most read paper from the past 12 months on the Journal of the Atmospheric Sciences website. The paper, "Review of Aerosol-Cloud Interactions: Mechanisms, Significance, and Challenges," has been accessed 1,390 times since being published online in October 2016. Fan co-wrote the paper with Yuan Wang (California Institute of Technology), Daniel Rosenfeld (Hebrew University of Jerusalem), and Xiaohong Liu (University of Wyoming). They discussed how aerosols—tiny atmospheric particles—interact with different kinds of clouds and influence precipitation and energy balance on regional and global scales. The authors also explored ways to overcome modeling and observational obstacles in studying aerosol-cloud interactions. Journal of the Atmospheric Sciences, an American Meteorological Society publication, highlights research related to atmospheric physics, dynamics, and chemistry on Earth and other planets. Fan, who got her PhD in atmospheric sciences from Texas A&M University in 2007, is a noted expert in aerosol-cloud interactions. The British Broadcasting Corporation (BBC) World Service and journals such as Science and Nature have featured her research. Fan recently was selected to receive a 2017 Early Career Research Program award from the U.S. Department of Energy, and she will use the grant to study severe thunderstorms in the central United States.